Pancreatic cancer is a great oncologic challenge. 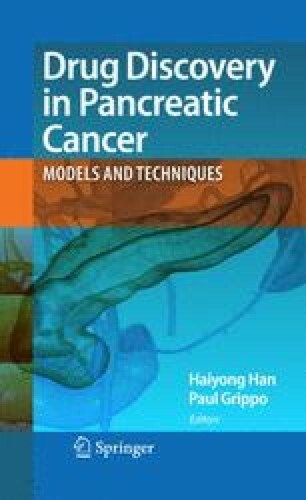 Significant progress has been made in understanding the molecular genetics for transformation of pancreatic epithelia into pre-malignant neoplasia and eventually invasive carcinoma. In spite of these advances, effective treatment is still lacking, and the prognosis of most patients diagnosed with pancreatic cancer is dismal. Molecularly targeted agents show great potential for improving treatment in pancreatic cancer cells and animal models. However, translation of the preclinical studies into clinically useful drugs with meaningful benefits for the patients remains to be accomplished. Development of zebrafish models and application of innovative techniques will enable drug discovery for pancreatic cancer in a whole organism. The established models including wild-type zebrafish larvae, germ-line mutants, transgenics, and xenografts can be utilized to identify the genetic pathways and their interactions that control exocrine pancreatic development and cancer. Combined application of chemical genetic screens with radiographic imaging, nanoparticulate systems, and bioinformatics in the zebrafish models is expected to facilitate identification of drugs that specifically target the signaling networks in pancreatic cancer stem cells, and validation of candidate therapeutics by real-time monitoring of tumor growth. Ultimately, a systems-biology approach that applies the various techniques to the zebrafish models is predicted to lead to discovery of efficacious and safe drugs toward the goal of targeted and personalized therapy in pancreatic cancer. The work in the author’s laboratory is supported by the National Institutes of Health (DK060529, DK071960); Pilot Grant in Translational Research by the Department of Internal Medicine of the University of Iowa; the American Cancer Society Junior Faculty Seed Grant Award (ACS #IRG-77-004-31); the Fraternal Order of Eagles, and the Cancer Center Support Grant (CA086862) by the National Cancer Institute to the Holden Comprehensive Cancer Center at the University of Iowa. The Zebrafish International Resource Center is supported by a grant (RR12546) from the NIH-NCRR.